When you talk about the good old days of Indian football, two clubs from Bengaluru always find a mention in this discussion - Hindustan Aeronautics Limited (HAL) and Indian Telephone Industry (ITI). Both these clubs have their place etched in the books - ITI for winning the first-ever Federation Cup in 1977 by beating Mohun Bagan and HAL for dominating Karnataka Football and even playing in the I-League. Yet, all those achievements are nothing more than a history lesson for most people reading this - let's call them the internet generation. Both of the club's heydays date back to the 60s and 70s when most of us weren't even born. Unlike the existing rivalry between Mohun Bagan and East Bengal, all we know about HAL and ITI's hard-fought matches are from books written by Indian football historians and nostalgic pieces on newspapers. But Saturday, the 19th of January 2019, was different. Bengaluru FC, the club that this internet generation relates to quite well, brought HAL and ITI together in a legends match. And as a surprise, they even let six of their first-team players feature in the second half of this game for about 10 minutes. 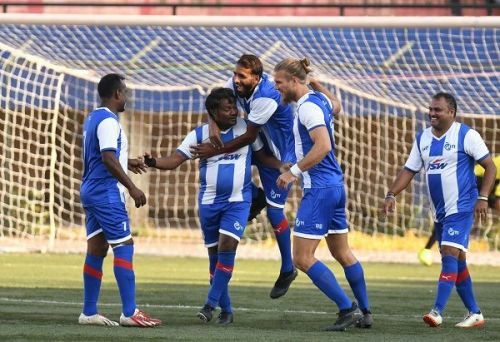 While Erik Paartalu, Gursimrat Singh and Harmanjot Khabra played for ITI, Juanan Gonzalez, Rahul Bheke and Chencho Gyeltshen turned out in HAL colours. In those 10 minutes, Khabra provided two assists for RC Prakash, who bagged a brace in ITI's 2-0 win. "It was a collective decision from the entire setup to host this match," Mandar Tamhane, chief technical officer of Bengaluru FC, says. "Srinivas Murthy, our head of operations, is from Bengaluru and he took up the initiative for this. "We know what these clubs have brought to football in terms of legacy. As Bengaluru Football Club, we felt it's necessary for us to pay a tribute to these clubs. We could have done it before, but we're happy that we hosted these legends now." We're not quite sure whether it's the last time we will see the final frontiers of HAL and ITI, but it could just be that as most of the players are nearing 50 years of age. For Australian midfielder Paartalu, who was playing a legends game for the first time, it was special. "Actually, while watching the first half, I was starting to get in the mindset of playing a real match," Paartalu, who proved to a solid rock at the back to hold off the threat of Xavier Vijay Kumar, said. "I wasn't expecting the quality that they showed, they know the game so well and it was a pleasure to be alongside them on the pitch. "I wish I could have played more minutes, to be honest, football brings the best out in people and they made me feel a part of their side straight away." "It was my first time in a game like this. And I only have one mode, which is to compete. I can't play relaxed or to enjoy, I have to play to win so it was a nice afternoon," Paartalu added. Tamhane continued, "Furthermore, it's vital we recognize these guys for what they have done for Bangalore football, without their dedication and success maybe JSW would never have chosen Bangalore as a place to start up a team. "We are forever thankful for their contribution. Our next step is trying to get some more homegrown talent into the BFC squad as it's important for the region and I hope we can unearth some of these guys soon." Bringing together the two teams did not take much effort, Tamhane says. "Once you mention a match between HAL and ITI, it happens on its own," Tamhane remarks. The crowd too seem to have gathered on its own. One stand - the original West Block A - was dedicated to the West Block Blues. The main central stand had its share of VIP guests from ITI, HAL, Bangalore District Football Association (BDFA) and Karnataka State Football Association (KSFA). The rest was filled up by veterans of the game and some of those craving for nostalgia. "If you look at the macro level, the game between HAL and ITI can be compared to a match between India and Pakistan," Satya Narayan, a former journalist who is part of the KSFA governing board. Lionel, who was the captain when ITI won the Federation Cup in 1977 said, "The work timings in these factories used to end by 3.30 pm. After that, some of the buses used to bring the workers to the stadium directly. ITI, in their traditional white and blue, used to play a nice passing game. HAL, in the green, had great dribblers and used to rely on a lot of those individual skills. "The atmosphere of this derby was crazy. Each team would bring its own band and there would be a lot of noise in the stands. The tickets for their matches would cost about Rs 1 or 2. "About 8,000-10,000 people would come to these matches and most of them would watch the games standing. Even if a team was winning 2-0, there used to be enough in it for the spectators. Whatever passion you had, you could let it out in this game. We grew up with this rivalry." One of those who had turned up to see what all the hype was all about was Vijay RB, a Bengaluru FC supporter and member of the West Block Blues. Vijay was one of the 50 WBB members who rediscovered some of the Indian football idols on Saturday. "I've only heard a lot about the HAL-ITI rivalry," Vijay said. "The game on Saturday gave us a glimpse of what it's all about. "I've heard that the rivalry was intense and players used to give their all whenever the match was between HAL and ITI. From what was on display on Saturday, I could figure that out. Even though these guys are ageing and are not exactly as fit as their playing days, they were fighting it out every minute of the game. And that was great to watch. "Bengaluru FC players being part of it made it even more special for a Blues fan like me. Their cameos added to what was a fun outing for those in attendance, including the players on the field." It certainly added to the atmosphere. RC Prakash wouldn't have got his two goals if not for the fit and aggressive Khabra chasing after the ball. Chencho and Bheke did some of the running around for HAL but their time on the pitch ended before they could turn the game around. It didn't matter. 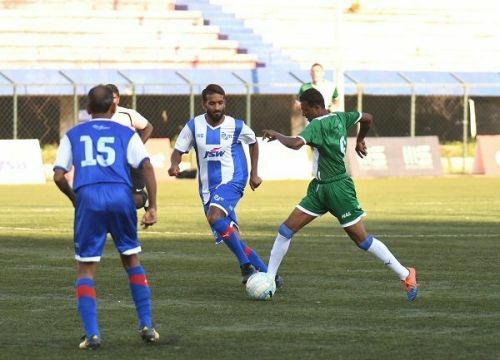 For one day, Bengaluru FC managed to bring together a club which shut up in 2005 and another which held on until 2014. For the players from both sides, it was the platform of playing together in front of a vociferous crowd which mattered. Even this exhibition match was indeed taken seriously by the veterans, divided by their loyalties to these institutional clubs. Whether it was asking for a change in the referee for not awarding HAL a penalty or the reactions of uneasiness and joy when ITI opened the scoring at the start of the second half, this game had it all. And it meant the world to the players. "It was a chance to show Bengaluru that I have still got it," said HAL's Xavier Vijay Kumar, now a coach at the Boca Juniors Academy, said. "Bengaluru FC did a great job by organising this and they should host such games more often. Playing with the BFC guys made it more special." Next slide - What next for institutional clubs?